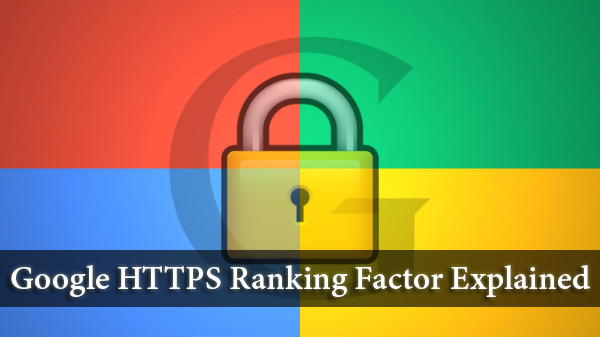 How Does The Google HTTPS Ranking Factor Work? Last week, Google announced that sites secured with HTTPS and SSL will now get a boost in search rankings. Previously, we only had speculations about HTTPS being a ranking factor, but Google's announcement made it official. Which makes it a good time to make the switch to HTTPS and get ahead of your competition before the playing field levels up again. But before you head off to take a look at your site's security, let's take a look at how this ranking factor actually works. What we know about this ranking signal? A common question people as is, how is this ranking signal related to Google's algorithms such as Panda and Penguin. Well, the fact is, it isn't! The HTTPS ranking signal is standalone signal, and is independent from any other ranking signal or algorithm. Unlike Penguin or Panda algorithms, this is a ranking signal that is run in real time. URLs get an immediate, tiny ranking boost as soon as Google indexes them. Is it Domain-level or Page-level? So far, it seems to be URL specific. Websites might have various sections, some running on HTTP while others on HTTPS. So only the HTTPS pages will see a small ranking boost, and not the other pages on the same site. What about News websites? Google's news index differs from the normal Google web index. But migrating news sites to HTTPS should have no issue. If you run a news website, i.e. a site that is included in Google news section, just go through the normal migration process and Google News will pick up on the change automatically. Google recommends that when you do a migration, use the change of address tool within Google Webmaster Tools. But you cannot - the change of address tool does not support HTTPS migrations yet, and there's no indication of when it will be supported. If you are doing the migration, a 301 redirect is enough of a signal to communicate the change, even without using the change of address tool. Another problem people are reporting is that, since the HTTPS ranking signal launch, Google has been sending out security certificate errors via Google Webmaster Tools. However, we haven't seen such problems, yet. I have to ask a question. Should I move my blog to SSL certificate then? With this change basically Google want to say this structure is not secure enough therefore a whole domain has to reconsider to HTTPS. What I begin to question is how this effects SEO strategies in terms of Link Building. Would it help to build back links pointing to our "Secure" Pages now? Should we use a mixture of both secure and non-secure Links (http vs. https)? If we're not 301 re-directing to "https", does this then negate all the Link building work we've previously done via "http"? My clients ask me these questions so any answers would certainly help.